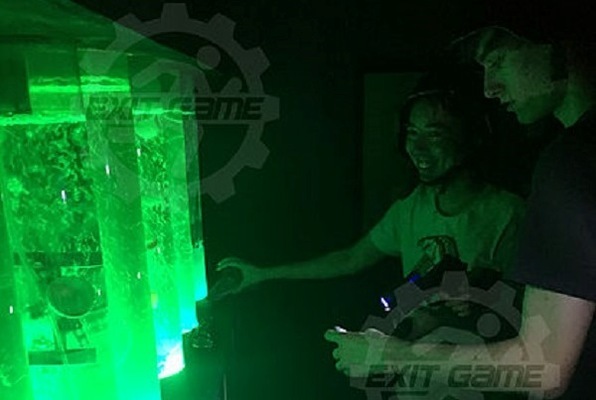 Reviews of escape game "The Lab 51"
The only issue I have with Exit Game is that they pair you up with strangers. I went with a group of 3 and they paired us up with a group of 4. The whole time I felt like they didn't really contribute to anything as they had no clue what was going on. All I can say is that you really have to think outside the box in order to escape this room. A great, well thought out venue. The staff is friendly and helpful. I can hardly wait to try the other rooms! Went here on a Saturday for a friend's birthday and did the Lab. It was a lot of fun! The story was that we were marines on a mission to escape an alien lab. You have 60 minutes to go through a series of complex puzzles, locks, clues, many rooms, and it was a great exercise in teamwork! It cost about $30/head and we had 10 people, which was a pretty good size for the challenge. The lab has a physical element to it where you need to crawl and duck your head low. They have alternatives if you cannot crawl or have claustrophobia, but it does take away from the overall experience, so opt for another challenge if that's a limitation of yours. Especially compared to the Escape Game in Anaheim, this place was much more complex and believable with all the props and game design. It's not cheap, but a fun thing to do with a group of friends if you are looking for something different. It's located on the basement level of the Atlantic Shopping plaza where Empress Harbor Seafood and Half & Half are. Parking is free and head down the escalators to find it. Had an AMAZING time!! Went and reserved to do The Lab which was absolutely amazing, from hidden corridors to amazing puzzles it DEFINITELY was best escape room I've been to. Had so much fun We immediately reregistered to do the Vault! This one was much more difficult but still had a blast! Staff was super friendly and helpful! Group there was Jen, Norris, and Brian, and they communicated the rules well and made sure everyone had an amazing time start to finish.